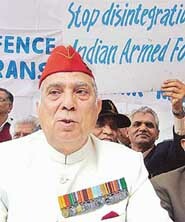 As Defence Minister Pranab Mukherjee today sought to put to rest the raging controversy over the survey of Muslims in the Indian Army by saying that the Indian armed forces were totally “secular and apolitical”, a number of former defence officials and other ranks led by former Deputy Chief of Army Staff Lieut-Gen Niranjan Malik (retd) took to the streets here, saying any religious headcount in the armed forces could undermine its apolitical, professional character. Will Rs 700 a quintal be a fair MSP for wheat? Sachin has bowled well in both the games. We are trying to develop the fifth bowler by using Sachin, Yuvraj and Raina. Two days after getting an invitation to meet the Prime Minister, the JKLF chairman, Mohammad Yaseen Malik, here today announced his party’s decision to meet Dr Manmohan Singh in New Delhi on Friday. A two-member team comprising Malik and general secretary Ghulam Rasool Dar will meet the Prime Minister. An all-party meeting, convened by the Election Commission today, failed to evolve a consensus on the state funding of election, which is aimed at curbing money power in elections. An Indian sailor was allegedly beaten to death by his colleagues on board a Norwegian oil tanker in the international waters off the coast of Fujairah in the UAE following an argument over the cartoon row. 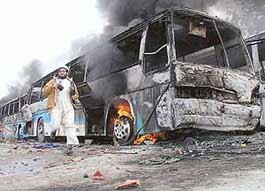 Violent protests in Pakistan against publication of Prophet Mohammad’s cartoons in European dailies claimed three more lives today as thousands of people went on the rampage burning cinema halls and western businesses in northwestern city of Peshawar. SPORTS: Will it be a decider? The Supreme Court’s directive on compulsory registration of marriages would apply to the people of all religious communities in the country and rules have to be framed by the Centre and states accordingly. France’s highest court, the State Council, today ordered Paris to suspend the transfer to India of the asbestos-lined decommissioned warship Clemenceau. The piercing cold wave gripping the middle and upper hill areas of Kinnaur district and the adjoining Spiti valley in Himachal Pradesh continued unabated on the second day today as the upper hill areas of the entire tribal belt experienced intermittent snowfall since Monday night.